Threads Culture is a performance review solution which focuses on company culture by making core values a key part of performance reviews and employee engagement practices. With Threads, users can generate meaningful reviews that measure employees against core values as well as their individual goals. With the aim of maintaining a constant review cycle and understanding the company culture at all times, Threads provides businesses with the tools to capture peer, self and 360 feedback that gets delivered in real time to management, not just at review time. Human resources teams are able to maintain visibility into communications to ensure their leaders are remaining accountable in delivering an efficient and effective employee experience. With Threads analytics, users can monitor company culture and make powerful changes in how management are rewarding and coaching their team, and see which members of the organization are strengthening culture, and who needs more coaching. Users can be confident that the right candidates are chosen for company job openings by ensuring that hiring teams are asking the right questions during the application process. Interview questions derived from core values make sure potential candidates are the right fit, and the Threads knowledge base provides additional support for writing job descriptions and interviewing candidates to aid with finding a team member who best fits the current culture. At RedPeak, we are a smaller company that highly values culture and its effect on long term retention. We searched for almost a year and evaluated a number of options, most of which were simply too cumbersome, formal and/or elaborate for our needs. Then we came across THREADS. Since I had done all the research and made the case for the switch, I was a bit nervous as to how it all would come together. Adjusting to new software, as well as, a different approach to reviews can be difficult in a company that values stability and consistency, and I was convinced in the process of completely changing our approach, something would go wrong. Was I wrong? The easiest transition we have made. The software worked, it is uber easy to navigate and the team embraced the new approach, once they understood they had an easy place to provide ongoing feedback on fellow team members. The weekly updates are invaluable, provide real insight to the remarkable recoveries and efforts team members make and potential learning/feedback opportunities that would provide assistance and support. The best part is that kudos/challenges get in front of the CEO, who waits for them each Friday, and has indicated their value. This product is not complicated, it does inspire ongoing peer to peer feedback, and truly helps the team understand the expectation from a culture and results perspective. How easy it is to provide feedback and understand whether or not we are delivering authenticity in regard to the cultural values promise we make the team. How easy it is to provide feedback and understand whether or not we are delivering authenticity in regard to the cultural values promise we make the team. I have had numerous onsite/field team members indicate they would use the system even more if there was an app. We are a marketing and advertising agency and it is critical that any system we operate in aligns with and supports our culture. Our previous review process also included core values, just as Threads does, and this is one of the many reasons we selected Threads. The build-out was streamlined and quick. We provided our agency infrastructure and job descriptions and Threads took care of the rest, quickly I might add. The system is very easy to navigate within and as our Threads representative said during our training sessions - if you can post on Facebook or send a text, you won't have any trouble navigating within Threads and, administration is just as simple! There is one unique benefit that Threads offers that many other vendors do not, or charge an arm and a leg for, and that is TRAINING. Threads conducted our training at each of our locations, both manager and employee populations, and these sessions were great, so beneficial. Don't overlook this when you are shopping. They charge travel expenses and that's all! This is invaluable as HR can partner with them during that training, which I feel was a significant benefit to our roll-out and agency. Thanks to all including technical support - they are just as great! There really isn't anything we have come across that we do not like. The system is simple and the functionality is key. Companies are always evolving and Threads has the fluidity to evolve along with us. I found Threads though Software Advice, they were the first product we demoed and I LOVED it. The rest we demoed afterwards didnt stand a chance. We have been looking for more ways to integrate our values into daily life at our company and this fit the bill. We are a mid-sized company as is Threads and I think immediately there were a lot of synergies. We actually did a demo with the CEO of Threads with the CEO of our company, and that was very impactful. The product is soooo easy to use its ridiculous. Incredibly user friendly. We sprung for the in-person training and the staff really enjoyed it - got great feedback. The CEO is a great public speaker and everyone could relate to what he was preaching. Their customer service is also amazing, if you call them you talk to a real person, and today when I called with a question the CEO himself answered! Another thing I loved is that Threads never badgered me for the sale. Other vendors I demoed were getting CRAZY calling and emailing me nonstop, but Threads followed up once I think and that was it. And the rest PALED in comparison, I knew from the minute I saw Threads I had to have it. There isn't really anything, it's quite different from our previous performance review system (which was pathetic to say the least), so outside of staff getting used to the new system, there hasn't been anything bad. If your company takes pride in their unique culture and values, Threads is a must.Easy to use platform for continuous tracking of employee performance. The Threads admin staff is extremely knowledgeable and easy to work with. They go out of their way to try and accommodate all of our company's needs. The automatic generated review draft upon completion of a review is a nice feature. 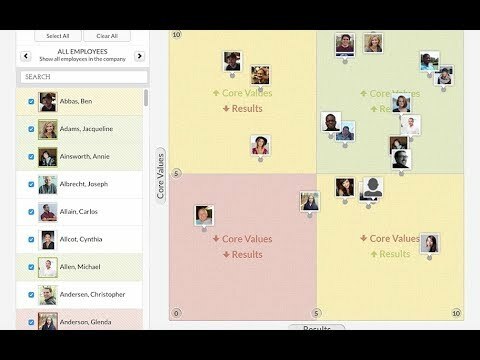 Easy to use platform for continuous tracking of employee performance. The Threads admin staff is extremely knowledgeable and easy to work with. They go out of their way to try and accommodate all of our company's needs. The automatic generated review draft upon completion of a review is a nice feature. There are some limitations within the system that is not customizable (i.e. review frequency is company wide instead of employee based, job descriptions can not be customized per employee - only by job title). Threads allows our company to decide what's most important to us, and how to measure those values instead of just evaluating our employees on their job performance and responsibilities. We couldn't agree more with Threads' belief that "In a great culture, it’s not just what you do, but how you do it. "I love that Threads is so easy to use; all the features in it feel intuitive and you don't waste time clicking around figuring out which tab to scroll down to find where this info goes, only to click back to 3 other pages to see it graphed. It's all connected and makes sense. I also love that I don't get endless emails or calls from the Threads team trying to promote other products or sell me extras. Everything's already included in the subscription - all features, all future upgrades, all the support I could ever need. I love that Threads is so easy to use; all the features in it feel intuitive and you don't waste time clicking around figuring out which tab to scroll down to find where this info goes, only to click back to 3 other pages to see it graphed. It's all connected and makes sense. I also love that I don't get endless emails or calls from the Threads team trying to promote other products or sell me extras. Everything's already included in the subscription - all features, all future upgrades, all the support I could ever need. It's still early in our experience with Threads, but so far, there's nothing we'd change other than the MOST minor thing - the initial training to learn how to use the software was a bit redundant and drawn out, but I'd take that any day as opposed to being confused and not receiving enough support. Pricing is based on the number of positions in the company. Contact Threads Culture for more information. Manage expectations and encourage better communication by conducting meaningful performance reviews that measure individuals against the businesses core values and their unique goals. See who is adding to the company culture and who is detracting from it by viewing the health of your culture with visual analytics which can be broken down into teams and individuals. React in the moment by capturing peer, self and 360 feedback all year round that routes to those who need to see it in real time, rather than only at review time. Maintain up-to-date organizational information with an easy to use drag and drop organizational chart. Ensure the organizations is hiring the right people by generating accurate job descriptions and interview questions that reflect company core values and the position's unique results. Create and maintain up-to-date job descriptions that truly reflect the organizational fit and expectations for the role and use the Threads knowledge base for additional guidance. Below are some frequently asked questions for Threads Culture. Q. What type of pricing plans does Threads Culture offer? Q. Who are the typical users of Threads Culture? Q. What languages does Threads Culture support? Q. Does Threads Culture support mobile devices? Q. Does Threads Culture offer an API? Yes, Threads Culture has an API available for use. Q. What other apps does Threads Culture integrate with? Q. What level of support does Threads Culture offer?